A local family heirloom of the Deep South, originating in Houston, Texas, an area not conducive to growing a wide variety of apples. The apple was first raised by Reverend Herman T. Morgan in 1965 from seeds of Granny Smith and produced its first fruit in 1972. It is well adapted to most regions and has been raised in agricultural zones 7 through 9 as well as areas further north. 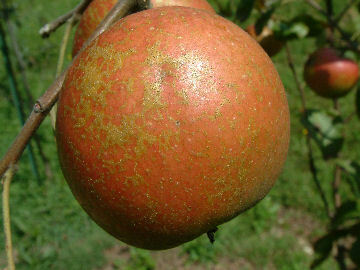 Fruit is medium to large, roundish-conical with rich pinkish-red skin. A fine quality apple that ripens in August.